Russia has big designs on the Arctic. Its forces have been very active in the inhospitable region over the last few years, showing off their high-tech gear and ability to deploy rapidly to the harsh environment. Now it appears they are also preparing to operate on the other end of the spectrum, taking up local nomadic people’s modes of survival and transportation. 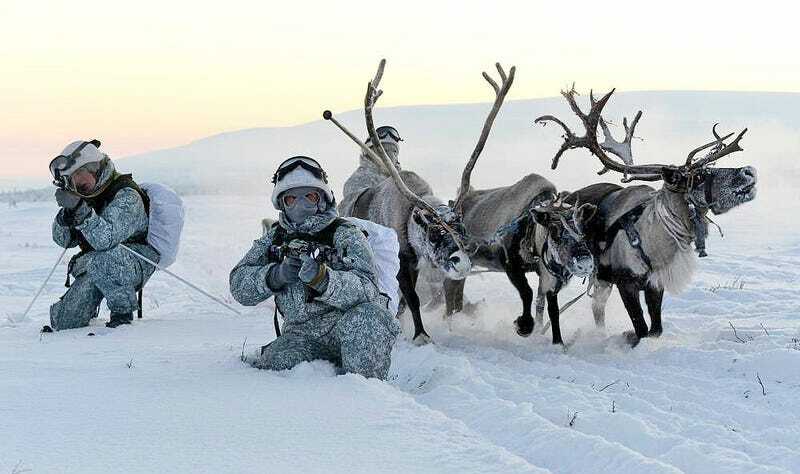 Soldiers of Russia’s Northern Fleet motorized rifle brigade are seen in these Ministry of Defence pictures and videos learning the ways of people who have lived in the frigid region for centuries. During their training, temperatures hit -30 degrees F, and instead of warming up in vehicles or mobile habitats, they used Chums, which are the tepee-like traditional shelter used by Siberian nomadic people. For transportation, dog sleds and reindeer replaced tracked vehicles and helicopters. In the past, we have regularly seen Russian “exercises” that look more like staged photo ops, and this may also be the case. But the idea of blending in among the native people and of learning how to fight with rudimentary support in a very harsh environment is absolutely relevant. People have survived in these conditions long before the internal combustion engine. By learning how they did it, and continue to do so, it is possible that an asymmetric advantage over potential enemies can be had. A modern example of this is how American special forces rode indigenous horses into combat in Afghanistan shortly after 9/11. This tactic, combined with precision air power and teaming with local forces, was hugely successful and helped lead to the blitzkrieg-like sacking of the Taliban. As for the U.S. and NATO’s arctic fighting capabilities, it seems like they are slowly reacting to Russia’s northern focus with increased training and expanding mission capabilities in the upper-most latitudes. Still, after fighting in the deserts of the middle east for decades, the U.S. and its allies have a long ways to go to even begin to catch up.